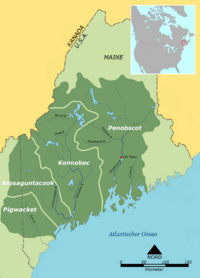 The Penobscot (Panawahpskek) are a sovereign people indigenous to what is now Maritime Canada and the northeastern United States, particularly Maine. They were and are significant participants in the Wabanaki Confederacy, along with the Abenaki, Passamaquoddy, Maliseet, and Mi'kmaq. The word "Penobscot" originates from a mispronunciation of their name Penawapskewi, which means "rocky part" or "descending ledges" and originally referred to the portion of the Penobscot River between Old Town and Bangor. Penobscot is also the name of the dialect of Eastern Abenaki (an Algonquian language) spoken by the Penobscot people. The Penobscot were peaceful, although they had learned to defend themselves well against attack by the Iroquois, working together with their Wabanaki confederacy allies. They adopted Christian teachings from the French Jesuits. When the British came they were able to forge good relations with them, primarily through the efforts of Joseph Orono, in whose honor the settlers named the town of Orono, Maine. However, the arrival of the Europeans brought them great troubles. As with many Native Americans, their numbers were drastically reduced by European-borne diseases. Their lifestyle was also severely threatened by the Europeans who took over their traditional hunting grounds and over-fished the rivers, such that the Penobscot had little to eat. Forced to change their lifestyle, the Penobscot established their reservation on a small tract of land and developed other subsistence skills. Contemporary Penobscot live on their reservation in Maine. Today, they run businesses, manage their natural resources, provide education and health care to their members, and social services to the poor and elderly in their community. Traditional basket making flourishes in cooperation with the other Wabanaki tribes, an art that not only provides income but allows contemporary Penobscot to preserve their culture and express their creativity inspired by nature, just as their ancestors did before them. The Penobscot homeland is along the Penobscot River in Maine. This large river runs from their sacred mountain to the north, Mount Katahdin, down through the state to Penobscot Bay. It was along this river that they made seasonal relocations to the ocean for seafood, and then back inland for moose, deer, and bear hunting, as weather dictated. The Penobscot were part of the Wabanaki Confederacy, formed to defend themselves against attack by the Iroquois, and consisting of the similar Algonquian peoples the Abenaki, Maliseet, Mi'kmaq, and Passamaquoddy. They covered the areas now known as Maine, New Brunswick, and Nova Scotia. Originally, Penobscot numbered over 10,000, but wars with the Mohawk, conflicts with European settlers, and diseases such as smallpox introduced by the Europeans, decimated their population. By the time the great chief Joseph Orono was born in 1688, the Penobscot people had been in close contact with French Catholic missionaries and traders for over a generation. Orono himself was of mixed ancestry, probably the grandson of Jean-Vincent d'Abbadie de Saint-Castin, The 3rd Baron Castin, who had settled at the mouth of the Penobscot River (the site of the present town of Castine, Maine) in the 1660s. Saint-Castin had married the daughter of Penobscot sagamore Madockawando, and their son, Bernard-Anselme de Saint-Castin, became the last leader of the tribe during its French alliance. His son was Joseph Orono. In the 1750s, the English from nearby Massachusetts defeated the French in Acadia, which included the ancestral lands of the Penobscot. English settlers began to populate the Penobscot River valley from the 1770s, putting pressure on the tribe. Chief Orono chose to accommodate the more numerous and better-armed white settlers as, in the course of his lifetime, they gained virtually full control of Penobscot lands, restricting the tribe to its largest island-village (which they called "Indian Old Town" because it was assumed to be of ancient origin). As a result of Orono's actions, the Penobscot did not retreat north to Canada as did the other Wabanaki tribes, but rather remained in their home territory. The Penobscot sided with the American forces in the Revolutionary War. In 1774, the English had founded a village called Stillwater, just below "Indian Old Town" at the site of a falls. Relations between the settlers and Indians had been sufficiently peaceful that, when Stillwater incorporated as a town in 1806, it named itself Orono, Maine, after the recently-deceased Penobscot sagamore, who had lived to the age of 113. The white men come and spoil all the game. They catch all the young ones and the old ones. We take the old ones and leave the young ones till they grow bigger and are worth more. … Let white men have the timber and the Indians have the game (Neptune 1820). But when our white brethren came amongst us they settled on our lands at and near the tide waters of our River and there was plenty of fish for us all—but within a few years the white men … built so many weirs that they have caught and killed so many of the fish that there is hardly any comes up the River where we live … we ask you to make a law to stop the white folks from building any more weirs forever so that fish may again become plenty and also stop the white people from using any seines above Kenduskeag on the main river. We also ask you to make the law so as to stop the white people and Indians from catching fish more than two days in the week in the season of salmon, shad and alewives at least for five years. We think that fish will then be plenty again (Neptune 1821). However, their pleas fell on deaf ears. Worse, when Maine became a state in 1820, treaties pertaining to Penobscot land made with Massachusetts were not honored and the Penobscot lost most of their traditional hunting grounds. They turned to other means to survive, using their skills at farming, basket making, and canoe building to make a living. The insignia of this tribe, evidenced in their art and design, is the fiddlehead, in this case an immature frond of the Ostrich fern (Matteuccia struthiopteris L.) that grows along the banks of the Penobscot River. Fiddleheads of this fern are a delicacy and are one of the first "blooms" appearing after the harsh winters of the region, thus considered a gift from a spiritual higher power—a reward for having survived the winter. 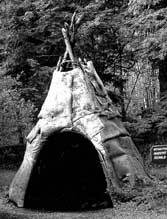 The Penobscot, like other Algonquian peoples, lived in wigwams covered with the bark of birch trees. Their life was semi-nomadic, traveling in the winter from their villages to hunt in the snow covered forests. Each family had their hunting grounds, and used birch bark canoes to travel to the area and snowshoes to travel over land. They trapped game such as deer, elk, and even bear which they could drag back to camp using toboggans (Waldman 2006). They also cultivated crops, particularly maize, around their villages, and also gathered sap from the maple trees and boiled it to make maple syrup. Fishing was an essential part of their diet, with fish caught from the river and, in the summer, clams, lobster, and crabs were caught in the ocean (Waldman 2006). Prior to European contact, Penobscot basketmakers produced sturdy work baskets and fish traps from brown ash–the Basket Tree–which grows in wetlands and around streams. The logs are pounded, causing the tree to split along its annual growth rings. These splints may be further split into widths ranging from 1/16-inch to 1/2-inch by use of a splint gauge. The splints are then woven to produce functional and decorative baskets. Over the years, different styles became popular as Penobscot artisans sold their baskets to make a living. Simple, utilitarian work baskets were made in quantity; beautiful, decoratively fancy baskets were created according to the fashions of the times. In Victorian times, for example, bright colors and curls were used as decoration. Today, baskets are seen as an artform and may be fashioned to resemble particular items, usually from nature such as an acorn or a strawberry. Native Americans in Maine, particularly the Penobscot, prepared beans by cooking them with maple syrup, with pieces of venison or other meat. Early New Englander's adopted the bean recipe, using molasses and salt pork in large pots. Penobscot beans, however, were baked in a hole in the ground, hence their name. The method of preparing bean-hole beans involves first digging a hole, about three feet deep and lined with rocks. A fire is then built in the hole, and burned down to large embers and ash (taking several hours). The beans and other ingredients are put in a cast iron pot, covered with water, and the lid is put on. Then the pot is placed in the hole and covered with the embers and and soil until buried. Cooking time varies but leaving the beans in the hole overnight is common. The Penobscot social structure consisted of loose groupings of villages, each with their own sagamore (Sagamas in the Penobscot language) or chief. Later they were also referred to as Governors and Lt. Governors. The sagamore was often, although not necessarily, also a shaman. These sagamores were elected, but there was a weak hereditary component to the position (Pritzker 2000). Chief Bashabez (or Bessabez) (died in the Micmac Wars in 1615 or 1616) was the first Penobscot chief documented by Europeans, although the Penobscot had many generations of Chiefs prior to Bashabez and they are proud to state that the Penobscot Nation is one of the longest continuously operating governments in the world. Significant Penobscot sagamores include Joseph Orono (1688-1801), after whom the town of Orono is named, and John Neptune (1767-1865), the powerful shaman who served as Lt. Governor (sub-chief) of the Penobscot for 50 years. While John Nepture was Lt. Governor, the Governor was John Attean (1778 - May 14, 1858) who was elected to the position for life in 1816. However, Attean and Neptune had political differences and their feud led to discontent which resulted in a faction known as the "New Party" electing a new governor, Tomer Soekalexis, and new lieutenant governor, Attean Orson. Many members of the tribe still followed Attean and Neptune, claiming they were elected for life, and their faction was known as the "Old Party." This split did not end until 1931. The Penobscot, like other Algonquian people, shared a belief in Midewiwin (also spelled Midewin). With the arrival of the French, the Penobscot were converted to Christianity, but many still practiced Midewiwin or co-practice Christianity and Midewiwin. According to Penobscot mythology, Tabaldak, the creator god, made humans and then Gluskabe (whose name has several variants associated including Glooscap, Glooskap, Gluskabe, and Klooskomba) and Malsumis sprang from the dust on his hand. Gluskabe and Malsumis both had the power to create a good world, but only Gluskabe did so. Malsumis still seeks evil to this day. Gluskabe is a hero, the "transformer" of the Wabanaki peoples. His name means "Man that came from nothing" or literally, "Man [created] only from speech." There are many stories that relate to how different animals were created and how they attained their physical characteristics. Gluskabe created the Penobscot River, the headwaters of which are located at the base of Mount Katahdin, when he fought a greedy giant toad that had swallowed all of the water in the land. Gluskabe killed the toad, and thus created the Penobscot water shed, largest on the north east coast of what is now known as New England. In Nicolar's (1893) self-published account of the Penobscot from the Creation myth through stories of Penobscot history, precontact material culture, feats of shamanism, and ancient prophecies about the coming of the white man, Gluskabe is known as Klose-kur-beh. Nicolar described Klose-kur-beh's journey in which he is instructed by the "Great Being" in both practical and spiritual knowledge. He is then charged with teaching the people that there is only one Great Spirit and how to follow the will of the Great Spirit. Joseph Nicolar was an elder and the grandson of the Penobscot's most famous shaman-leader, John Neptune, who held the office of Lieutenant-Governor of the tribe for 50 years. Nicolar's account illustrates how the Penobscot incorporated Christian teachings into their traditional belief systems, giving Klose-kur-beh the role of the savior. Pamola (also known as Pamolai, P-mol-a, Pomola, and Bmola) is a legendary bird spirit that appears in their mythology. This spirit causes cold weather. 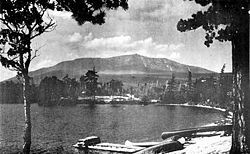 Specifically, according to the Penobscot, Pamola inhabited Mount Katahdin, the tallest mountain in Maine. Pamola is said to be the god of Thunder and protector of the mountain. He is described as having the head of a moose, the body of a man, and the wings and feet of an eagle. Pamola was both feared and respected, and his presence was one of the main reasons that climbing the mountain was considered taboo. Pamola's name is now preserved on Pamola Peak, a summit on Katahdin at the eastern edge of the Knife Edge ridge. The Pamola Lodge of the Order of the Arrow is an honor camping society of the Boy Scouts of America; Pamola's image is commonly used on several of the society's insignia. In 1973, the Penobscot tribe was one of the first Native American tribes to begin gambling enterprises with the opening of Penobscot High Stakes Bingo on their reservation. Many Penobscot continue to live on the Penobscot Indian Island Reservation, which is near Old Town, surrounded by the waters of the Penobscot River. The Penobscot became federally recognized through the Maine Land Claims Act, signed on March 15, 1980. Under the terms of the agreement, the Penobscot and Passamaquoddy tribes received a settlement of $81.5 million in return for relinquishing their rights to 19,500 square miles, for roughly 60 percent of the state of Maine. With this money they were able to buy back a portion of their ancestral lands, establish businesses, the Penobscot Nation Museum, and a trust fund to support tribal members. Although the demise of the Penobscot appeared imminent in the nineteenth century, the beginning of the twenty-first century saw the tribe thriving. Today, they run businesses, manage their natural resources, provide education and health care to their members, and social services to the poor and elderly in their community. Their achievement has involved both acculturation, in adapting to the dominant culture and changing conditions, and a resistance to assimilation through a preservation of their heritage in the form of legends, dance, and other aspects of their traditional lifestyle (MacDougall 2004). Penobscot basketmakers continue to use the tools and techniques passed down from their ancestors to produce sturdy work baskets and finely woven fancy baskets. In 1992, the Maine Indian Basketmakers Alliance (MBIA) was formed to promote all aspects of this tradition from the gathering and preparation of brown ash and sweet grass to actively promoting and marketing baskets made by Penobscot and the other Wabanaki tribes. The MIBA opened a retail store, the Wabanaki Arts Center, in Old Town, Maine in 2002. Filmmaker Jim Sharkey produced a documentary in 2003 that brings together the life and artistry of one such Penobscot basketmaker, Barbara Francis. She explained how the baskets are full of history, tradition, culture, and spirituality. Just as her elders taught her to make baskets she teaches the next generation—not just baskets but the heritage of the Penobscot. Joseph Orono (1688-1801) was a Penobscot chief or sagamore who lived on the Penobscot River. The town of Orono is named in his honor. John Neptune (1767-1865) was a powerful shaman and sagamore of the Penobscot who served as Lieutenant Governor of the tribe for 50 years, shaping the social and political history of the tribe (Eckstorm 1980). Molly Molasses (1775-1867), real name Mary Pelagie (or Balassee) Nicolar, was known to everyone as Molly Molasses. She was born in a Penobscot camp in today's Bangor, a powerful shaman who would heal the sick but also put a curse on those who angered her (Brown 2008). Joseph Nicolar, Penobscot Tribal Representative to Maine State Legislature and author of 1893 book, The Life and Traditions of the Red Man. Louis Sockalexis, was born on the Penobscot Indian reservation near Old Town, Maine in 1871. His grandfather was Chief of the Bear Clan. He was one of the first native Americans to play major league baseball. Andrew Sockalexis was born into a family of athletes on January 11, 1891, the younger cousin of Louis Sockalexis. He was a marathon runner who competed in the 1912 Stockholm Olympic Games. Molly Spotted Elk, born on November 17, 1903, in the Penobscot reservation in Maine, was a successful vaudeville dancer and appeared in the silent film The Silent Enemy (1930). However, the discrimination she suffered because she was Native American led her to pursue a dancing career in Paris (McBride 1997). Charles Norman Shay, the grandson of Joseph Nicolar, a decorated war hero of Omaha Beach, Normandy in World War II, he received the French Legion of Honor medal on November 6, 2007 (Loring 2007). America's Story from America's Library. Bean-Hole Beans: A Local Legacy. The Library of Congress. Retrieved October 23, 2008. Bourque, Bruce J. 2004. Twelve Thousand Years: American Indians in Maine. Lincoln, NE: Bison Books. ISBN 0803262310. Brown, Jason K. 2008. Molly Molasses. Acacia Artisans. Retrieved October 1, 2008. Calloway, Colin G. (ed.). 1991. Dawnland Encounters: Indians and Europeans in Northern New England. Lebanon, NH: University Press of New England. ISBN 0874515947. Doherty, Katherine M., and Craig A. Doherty. 1996. The Penobscot. Franklin Watts. ISBN 0531157644. Eckstorm, Fannie H. 1980. 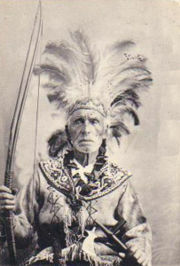 Old John Neptune and Other Maine Indian Shamans. Orono, ME: University of Maine Press. ISBN 0891010440. Godfrey, E. John. 1872. The ancient Penobscot, or Panawanskek. The Historical Magazine and Notes and Queries concerning The Antiquities, History, and Biography of America. XXI(II): 85-92. Retrieved October 1, 2008. Loring, Donna. 2007. "A Salute to Charles Norman Shay." Bangor Daily News. Retrieved October 1, 2008. MacDougall, Pauleena. 2004. The Penobscot Dance of Resistance: Tradition in the History of a People. New Hampshire. ISBN 1584653817. Maine Folklife Center. 2008. Bean Hole Beans. Maine Folklife Center, University of Maine. Retrieved October 23, 2008. McBride, Bunny. 1997. Molly Spotted Elk: A Penobscot in Paris. Norman, OK: University of Oklahoma Press. ISBN 0806129891. McBride, Bunny. 2001. Women of the Dawn. Lincoln, NE: Bison Books. ISBN 080328277X. Mundell, Kathleen. 1992. Basket Trees/Basket Makers. Maine Arts Commission. Neptune, John. 1820. Address by Penobscot Indian Chief John Neptune. Atlantic Salmon History Project. Retrieved October 23, 2008. Neptune, John. 1821. Petition of the Chiefs of the Penoscot Tribe of Indians. Atlantic Salmon History Project. Retrieved October 23, 2008. Nicolar, Joseph. 2007. The Life and Traditions of the Red Man: Reading Line: A Rediscovered Treasure of Native American Literature. Duke University Press. ISBN 0822340283. Pritzker, Barry M. 2000. A Native American Encyclopedia: History, Culture, and Peoples. New York, NY: Oxford University Press. ISBN 0195138775. Speck, Frank G.  1997. Penobscot Man. Orono, ME: University of Maine Press. ISBN 0891010955. Vetromile, Eugene. 2008. Indian Good Book—For The Benefit Of The Penobscot, Passamaquoddy, St. John's, Micmac, And Other Tribes Of The Abnaki Indians. Read Books. ISBN 978-1408614785. Maine Land Claim Maine Indian Tribal-State Commission, Hallowell, Maine, February 14, 1995. Tree and Tradition: Brown Ash and Maine Native American Basketmaking Hudson Museum, University of Maine.